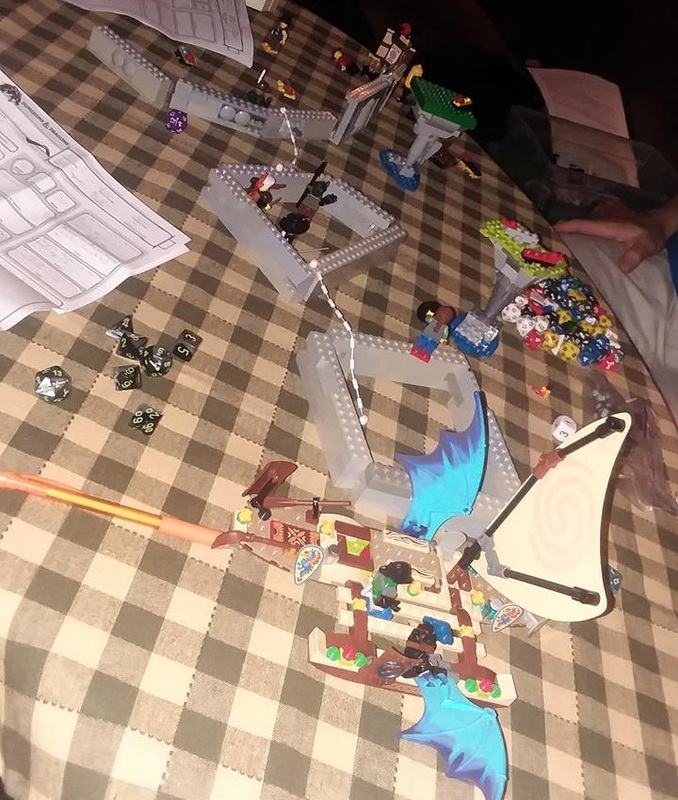 Lego minifigs and bricks make tabletop RPGs even better. The build is very easy. The friction of the normal Lego connection makes the plate pop out when you press the axle swiftly. It is easy to mass produce these things. Your players won't be surprised after the first one, but if you use them as your normal dungeon wall segments a lot, without triggering the trap, then they get used to it. Then you can use it in the middle of a combat encounter or some other situation when they are focused on something else in the map. I use a homebrewed system of handling activities that has proven to work very well for five years of sandbox gaming where the characters want to do lots of things. The core mechanic is that every time a character wants to undertake some significant task or project, they spend one or more hit dice. Hit dice represent an overall pool of energy, vitality, and competence that can be used for many things other than simple recovery. This means that leveling up allows characters to be more competent and productive out of combat, which is especially important if the game ends up focused on politics and skill use. When a character spends a hit die, they roll a skill or tool check to see the results. Because these checks represent many hours of sustained work, they cannot be boosted by things like Guidance, bardic inspiration, or anything else that would boost a single skill roll. Characters are assumed to be using all class abilities that could be helpful or increase productivity, like spellcasting, Fast Hands, Action Surges, etc., which is part of why high-level PCs can undertake more projects than low-level characters. I changed the long rest rules so they restore half of a character's hit points and all of their hit dice. Characters who are wounded from adventuring must spend hit dice to heal until they are up to half of their hit point maximum before doing anything else, and in times with no combat, characters can undertake a number of projects equal to their character level per long rest. In the field, I give the characters one free check after each combat encounter to search and loot the enemies or the environment. If they want to investigate any additional things, they must spend a hit die per investigation. This forces them to make choices and keeps the game moving. Using normal guidelines, decide how much loot the encounter would normally give. (I prefer to combine the hoard and individual creature loot and spread them out more equally among encounters, using a method kind of like the 4e treasure parcel approach.) Then double that amount and divide by the number of characters. When the characters do their first free loot check, they get that value of loot, of a type appropriate to what they searched, if they beat a DC 15 check. The DC should increase at higher levels, to reflect the fact that such rare and esoteric loot is harder to properly identify or harvest. As a general rule, further checks done by spending hit dice will normally give about 25 gp worth of loot on a successful check, similar to using a hit die to earn income as described below. You can raise this if they are in a rich environment and/or you want to encourage pushing their luck by spending their potential healing to loot, or lower it if the looting would not result in much or you want to discourage this behavior. However, you might rule that if most or all of the initial free checks failed, they can get their loot by spending hit dice to keep trying. I prefer using Body Part Loot, where most monsters 'drop' interesting magical ingredients rather than gold or art items. These are extracted from the corpse with Medicine or Arcana checks, or an appropriate tool proficiency. They can then be crafted in downtime as described below. I use this system with the 'Gritty Realism' long rest variant where a long rest is several days of recovery and happens once every week or two. All example projects below are based on that system. If you use it with the normal rest variant, make the projects and income smaller to compensate. *asking around to uncover a piece of information. *writing an important letter or report. *teaching a simple task to a henchperson. *finding the right person for a job position. Larger projects and long-term goals require more checks, ranging from a few successes to over a hundred successes in various tasks. If used for training, each Hit Dice will allow you to roll an ability check after you find an instructor. Learning to speak a language requires 25 DC 10 Wisdom checks. Learning to read and write a language requires 25 DC 10 Intelligence checks. Learning a tool proficiency requires 50 DC 10 checks of the appropriate ability. For small simple low-risk projects, or practicing a profession, simply spend a hit die, roll a check, and have the gp income or progress be the total check result. This matches the normal rules for crafting or following a profession, assuming an NPC or low-level character with one hit die. When doing something they are skilled in with a good stat, and spending one hit die per long rest to do so, they will earn or make an average of 15 gp per long rest, or about 2 gp per day of income or value added in the crafting. For example, if a character with smith's tools is attempting to craft a halberd (cost 20 gp), they will need to spend 10 gp to rent a forge and and buy steel, coal, and other supplies. If the check result is 10 or better, they complete it with their hit die of effort. At your discretion, higher check results can be turned into additional item crafting or income, so if the result was a 15, the character completed the halberd early and then earned 5 gp by working as a smith. A more math-intense option for high-stakes projects like working with volatile ingredients or gambling is to set a breakeven DC of 10 to 15, subtract that number from the check result, and multiply the difference by some number based on the stakes. This multiplier should be at least five and could be much higher. For example, a character playing games at a medium-stakes table might have a multiplier of 10. Any game involving bluffing is a Wisdom check with the gaming set proficiency, while pure games of skill are based on Intelligence. An average table of adventurers or soldiers would have a breakeven DC of 12 (base stat +1, half of them add a +2 proficiency), so if the character got a 20 on the check, they would gain 80 gold, but a check result of 10 would lose 20 gold. 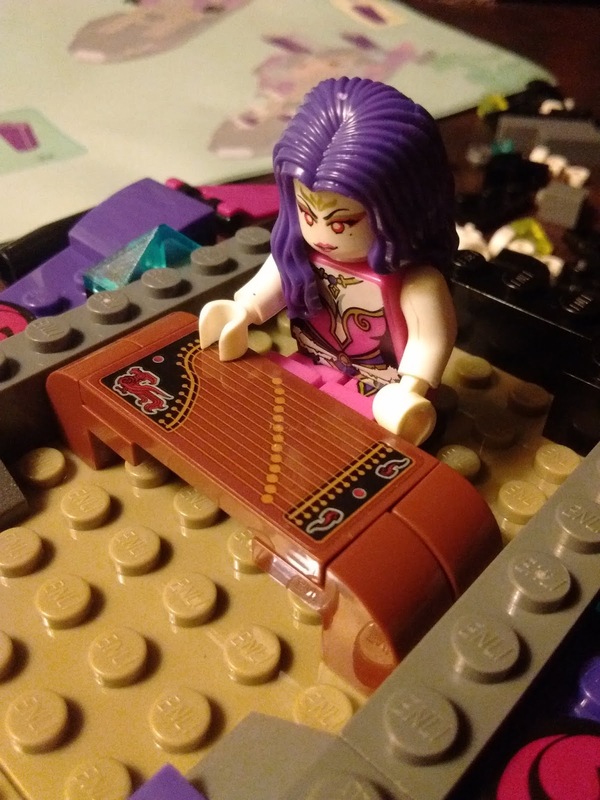 Characters will often want to use hit dice to craft magic items, especially if they have accumulated an inventory of interesting magical ingredients. I follow the same rules for crafting both magical and nonmagical items, as well as ships, strongholds, etc. and any other activity that earns income. I allow any character with a tool proficiency to craft magical items if they have access to appropriate magical ingredients (In my opinion, any rule system that does not allow a dwarf smith to craft a magic weapon out of exotic materials is simply wrong). Mark progress for all expensive items and large projects in units of 50 gp. Passing a DC 15 check makes 50 gp of progress (i.e. turning 25 gp of ingredients into 50 gp worth of completed item). Failure means no progress was made and nothing was wasted (unless a critical failure was rolled). This means that, on average, each hit dice spent will add about 15 gp of value to the ingredients, assuming a decent check modifier. I set the value of common items at 50 gp, to match the item cost pattern and encourage their creation, so one successful check will turn 25 gp worth of ingredients into a common item worth 50 gp. Crafting an uncommon items requires 250 gp of ingredients and ten successful crafting rolls, and each level thereafter is ten times as expensive. This matches the item creation cost in the DMG, when you consider the opportunity cost of the character's time. Alternately, you can have them attempt to turn 12 gp of ingredients into a common item, and have the ingredients be destroyed on a failure. If your players like high-stakes gambling, you can also have them attempt to turn 120 gp of ingredients into an uncommon item by spending ten hit dice (possibly over several game sessions) and making a single roll at the end, with all ingredients destroyed and all effort wasted on a failure. For the past several months I have been running a 5e spelljammer-inspired game for a group of relatively new players. Previously, I added spelljammer features to the second half of a campaign that lasted four years. It went really well both times. Sailing through the sky is inherently cool, and a world of floating islands makes adventure and exploration a lot easier. If you are a player, you only need to read the first three sections: Basic Rules, Setting Recommendations (the world I use in my game), and Zero Gravity Movement. Everything after that is only needed for people who are running the game. Actually, you don't even need to read any of this. Nothing has changed from the basic rules, and you can make any kind of character you would normally make. This is just a different kind of world to explore. Your character might know nothing about it before being asked or hired to join the crew of a magical boat flying through the sky to strange places. There are no stars or planets as in our universe. The game setting, wildspace, is a big zero-gravity zone of breathable air with lots of things floating in it, including islands of various sizes and ecologies, rivers coursing through space like veins, derelict ships and abandoned fortresses, floating forests anchored to nothing, chunks of elemental matter, giant creatures floating lazily around, stormclouds of magical energy, rips in the fabric of space that lead to other places of existence, skulls of dead forgotten gods, etc, etc. The sun is a thing the size of a large ship that flies through the sky every day, and stars are boulder-sized chunks of elemental fire. People travel through wildspace in a variety of ways, but the most common is in specially designed sailing ships with masts for catching wind and wings for steering. These ships usually sail the winds, but they can also land in a space river and let the current carry the ship along, or moor to a space rock that is known to travel in a predictable route. Gravity works differently. The floating islands make gravity in a hemispherical gravity bubble with a radius about equal to the radius of the island. All gravity in the gravity bubble is the same one-gee strength, and the gravity shuts off completely outside the bubble. Adventurers dock at the side of the island at the gravity plane on the bottom of the gravity bubble, somewhat like landing a sailing ship at an island, and then walk around on the island to explore it. Most ships cannot stay up in gravity, so they cannot fly too close over an island. Ships also make their own gravity bubble so people can walk on the deck. For more details, see the Physics Appendix at the bottom of this post. Players: this is the tone and world for the game I am running. GMs: you can use this or something else. Spelljammer inherently is tied to the feel of the Age of Exploration. It is an excellent opportunity to explore ideas and settings relating to that time in history. My game setting for the previous game was similar to 17th century North America. My knowledge of that region's ecology, culture, and history made it easier to describe things and invent details on the fly. Depending on your knowledge and interest, you could also do Mesoamerica, the Caribbean, the South Pacific, Africa, Asia, or any other place affected by the Age of Exploration. Given their place in spelljammer lore, I suggest making the elves similar to the British empire. High elves are the government, navy, and aristocracy, and wood elves are colonists or pilgrims looking to make a new freer life in the 'wilderness'. They generally consider themselves loyal citizens, but that might change. In my games, the elves, like the British, have the most powerful navy and are consequently the dominant geopolitical force in wildspace. Their society is based around magical biotech, and they grow their powerful living ships from seeds in special locations. It works well to have the other traditional D&D races of dwarves, halflings, and humans be like other Europeans, i.e. alien invaders from a faraway land. All of the other races can then be the natives of the land your game takes place in. In my game, they were similar to Native American cultures like the Iroquois confederation. If you have players who do not know the setting, or just want to play a normal D&D character, or do not have a lot of time for preparation and world-building, let them use a traditional D&D race and be a soldier of fortune who joins a ship's crew or is hired to do something. They learn about this new world at the same time their character does. Players who want to make a rich backstory can describe their character's tribe and culture, and be a native of the land. This all naturally leads to themes of exploration, imperialism, and colonialism with rich narrative potential and opportunities for character growth and conflict. However, I recommend that the game setting have the overall morality and tone of the late 1800s rather than the 1600s. Most people are simply not capable of playing characters with the moral beliefs of the 1600s, and accurately representing that kind of world would be too depressing for the game to be fun. So, even though the world is infused with a jingoistic and arrogant spirit of colonial adventure, and racism and economic exploitation of underdeveloped people is considered okay, all non-evil characters should share an understanding that slavery is very wrong and other religions should be tolerated. They also have a Teddy-Roosevelt-style environmentalism and appreciation of natural beauty, rather than a complete contempt for nature and wilderness. Civilized societies have due process and rule of law rather than absolute monarchy and despotism. Characters with more modern moral beliefs are rare, but present, and would be considered Good rather than simply insane (although, atheism and materialism and any moral beliefs based on them would be insane, because the existence of gods and the persistence of souls after death are established scientific facts of the world). In my current game, I am using the historical approach less and instead adding in a lot of the fun stuff from Planescape and Eberron. It has much more of a sci-fi, noir, and pulp feel. Adventurers congregate in fueling depots on island outposts that have shady characters of different races all mixed together. The tavern in the players' home port is kind of like a cross between a dive bar in Sigil and the Mos Eisley cantina. When jumping through zero gravity, the normal jump distances are ignored. Characters can go as far as they want, and they can shoot things and cast spells while their momentum carries them in a straight line. The difficulty is landing in the right place and not getting hurt when they reach the destination. This is done with an Athletics or Acrobatics check. DCs to hit a target 5-foot cube increase with distance and relative velocity. Falling damage might apply if they failed the check or jumped into a gravity bubble or onto something with a high velocity. Failing the check by a lot might mean missing the target completely and drifting off into space. In one round, they will travel two to four times their movement distance, depending on their check. Everyone without a fly speed will want to have at least one grappling hook on their person at all times. Using it to hook onto something is a dex-based ranged attack. Any character who has spent a lot of time in space and/or practiced with them can add their proficiency bonus to the attack. Moving along the rope (or any rope or climbable surface in zero gravity) can be done at the character's normal movement speed with no check if both hands are free. There are also a variety of wildspace creatures that can serve as zero-gravity mounts. You can decide what they are, or let the players imagine what they want to ride. Use the cost and stats for a riding horse or warhorse with an exotic saddle, but with a flying speed. These creatures can only live in zero gravity and cannot move into gravity bubbles. (Mounts like pegasi that can fly in gravity are as expensive and/or difficult to obtain as they would be in a normal campaign). The mounts are stabled and carried along in pouches or nooks attached to or built into the ship. Mounts can often graze or forage depending on the wildspace terrain the party is traveling through, so carrying one or two will usually not decrease the range of a larger ship. If the mount is combat-trained like a warhorse, the melee characters can ride them in combat when the ship is attacked, using the standard mounted combat rules. At higher levels, characters will want Brooms of Flying or Winged Boots for personal mobility in space. In all but the lowest-magic settings, these are standard equipment for space adventurers and most shipyards will sell them for 500-1000 gp. Riding a broom requires a free hand at all times unless the character has the Mounted Combatant feat. At your discretion, these items might only work in zero gravity, allowing for movement in space while keeping the party from having too much tactical advantage in dungeons and other ground adventures. You can also change the flavor, for example making them rocket boots or something like a magitech speeder bike. Magic items that give characters a fly speed draw their energy from the character, so using them is like running or swimming a similar distance. This is fine for combat and short maneuvers, but it makes these items unsuitable for long journeys. They cannot replace ships. If a a character spends more than an hour a day using such an item, they must pass a Constitution check or suffer a level of exhaustion. Repeat the check each hour. At your discretion, you can add the following common 'magic' items to your game. They're not necessarily magical, and can be produced as a crafted item. They will often be found in low-level treasure hoards or carried by intelligent mid-level enemies, or they can be purchased in most towns with docks for 100 gp. Flapfin boots: These knee-length boots contain large flippers that are normally folded up, like an umbrella. In zero gravity, they can be unfolded to give the character a fly speed equal to half of their movement speed. Sticky Slingrope: This is a 50-foot spidersilk rope with a ball of sticky substance on the end. When in zero gravity, as an action, a character can throw the ball at any surface within 50 feet and the rope will attach. Then, with their move action, they can pull themselves to wherever the rope attached, and the rope will detach and be ready for another use. Until high levels, all naval combat is basically just a normal combat encounter, with random monsters attacking the ship, or pirates on fast unarmed ships trying to board, and the PCs defending their ship like it was a fort. Just keep the ship on the center of the combat grid and place everything relative to it as enemies move to keep up and intercept. If you want, and it is appropriate, you might describe the action as a chase scene with everything moving and twisting in three dimensions, but this does not affect the grid, because all locations and velocities are relative to the ship. This is a work in progress; I will add things or clarify as people request it or if it seems necessary. Feel free to request things in the comments. Distance, speed, and mapping are handled abstractly. All distances are defined, both on charts and in common conversation, in terms of a number of days of sailing. For example, "Crystal Island is three days sail from Gertrude's Rock." This convention developed because most ships travel at about the same speed, and it is difficult to measure distance or define locations in 3-D space. Maps and charts tend to be abstract and sparse, typically centered around instructions for traveling from one point of interest to another. The travel time to a place might be different than the travel time back, because of the prevailing winds or other conditions. There are a wide variety of ships designed for adventuring parties, which will move a party, a couple NPCs, and supplies between islands. Each ship is defined by one number: its range. The range is the number of sail-days travel (one-way) the ship can safely go. If the party exceeds the range without resupplying and resting off the ship, they have to pass Con checks each day or suffer exhaustion. Range is based on the ship's cargo space and facilities, and larger ships are required for longer ranges. The cost of a ship is 50 gp times its range squared. All other details are cosmetic and up to your imagination. 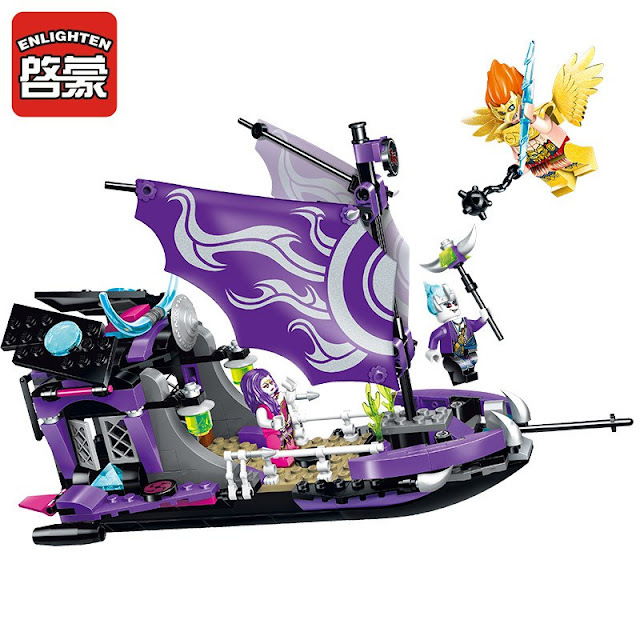 For example, the 50 gp range 1 ship is a flapboat, which is like a rowboat with wings instead of oars. It also has a little mast and sail. It has no facilities, just room for the party to sit down. They cannot sleep on it. Low-level parties will use flapboats to move to neighboring islands less than a day's travel away, and they will have to camp and on those islands. If the destination has nowhere to rest, and they will be adventuring on it, they can only go to a place a few hours away. By level 5 or so, after finding their first realm-tier (challenge 5-10) treasure hoard, a party should be able to afford the 5000 gp for a ship with a 10-day range (or at least the 3200 gp for a range 8 ship). Alternately, they might take it from a defeated raiding party, or be awarded it after a quest, or find and repair a crashed one. The range-10 ship (and ships with a similar range) will be like a 40-foot yacht, with a small galley and private bunks to sleep in. It will have storage capacity for 10 days of food, water, and supplies, including spare rope and sailcloth and tools to make minor repairs. It can be used to go to an unexplored or barren destination up to five days away, although a wise crew will limit such trips to places three or four days sailing away, in order to account for unexpected stops or emergencies. You can choose one of two options for the longer-range ships. If you want a lower-magic campaign that more closely resembles historical conditions, then make them larger to hold more supplies. 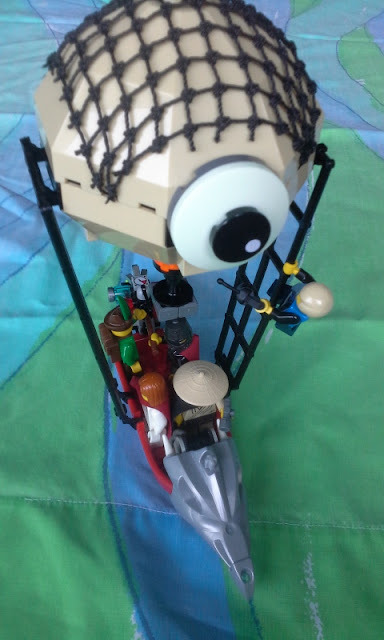 They will be harder to handle, and will require more crew members to move the larger sails and wings. Their list price includes the cost of hiring, training, and provisioning the additional crew. I prefer the magitech option where the adventurer ships with a range of 15 or more are faster rather than larger, because they are equipped with something like a spelljamming helm or an elemental engine. In this case, a range 30 ship costing 45,000 gp might be about the same size as the range 10 ship, and have ten days of food and water, but be equipped with something that lets it travel three sail-days distance in only one day. 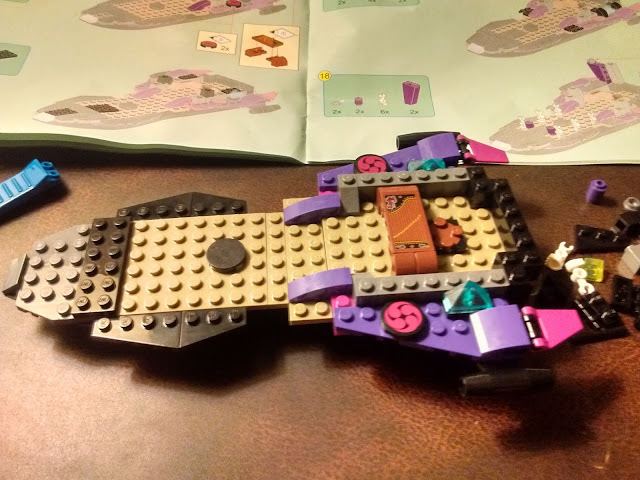 At your discretion, this increased speed may or may not not allow for faster tactical movement; it is possible that the ship still uses wings and sails for maneuvering but turns on the magitech for longer straight shots. Each sail-day traveled costs the party 1 gp of supplies, including food and miscellaneous supplies to fix (or fuel) the ship. 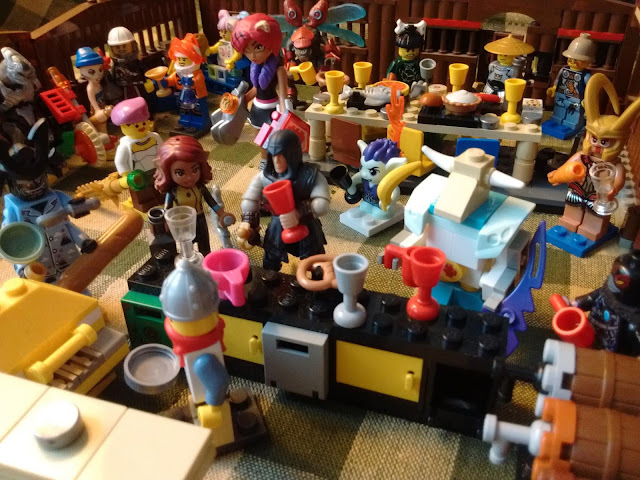 When the party gets back to port, they have to spend 1 gp to resupply for each sail-day they traveled, in order to restore the full range of the ship. In the case of faster magical ships, this cost is based on distance traveled, not time spent. In a medium to high magic world, mundane siege equipment is simply not worth putting on a ship. Their weight, and the extra reinforcement required to mount them, requires a heavier and more expensive ship that will require a larger crew to operate. It is far better to have the artillery be magic-users, and almost anyone who can afford to build a battleship loaded with ballistae can afford to hire magic-users and buy flying mounts or small fast ships for them. These kinds of forces make nonmagical warships obsolete in the same way that naval aircraft made battleships obsolete. Also see my previous post on adventurers making conventional military obsolete. 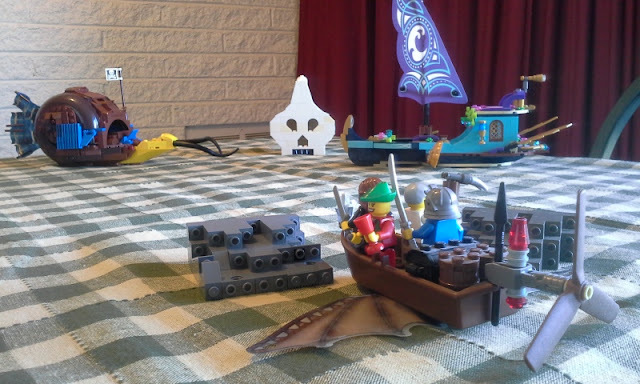 In a high-magic world, the party will be fighting enemies like them, so high-level naval combat will basically be a showdown against powerful NPCs using normal combat rules in interesting terrain. A low-magic world might have large warships outfitted with ballistae in the manner of traditional spelljammer ships, but at high levels the party can personally defeat such ships with ease, so they have no incentive to buy those kinds of ships or weapons. If they ally with a traditional navy to fight a larger force, have the mundane naval combat happen in the background as the casters rain ruin on anything in their vicinity and the melee fighters board the ships like marines and rip through their crew in a few combat rounds. However, there are many alchemical, magical, or magitech items that can boost the capabilities of an adventuring ship or serve as on-board weapons. Treat these as magic items. Whenever the party would receive a magic item from a treasure hoard, you can replace it with something that boosts the capabilities of the ship. Use the same rules and heuristics you would use for creating magic items and awarding them to the party. When in doubt, use an existing magic item and change its flavor. For example, instead of awarding a Necklace of Fireballs, you can give them a 'Goblin Rocket Pod' the size of a large crate that does the exact same thing when mounted on the ship. Damage-dealing weapons that affect normal enemies using the normal combat rules are from the same tier, but armor or items for the ship are a tier higher. All people on the ship benefit from the protection, in addition to the ship. For example, a Cloak of Protection is an uncommon item, so basic ship shielding would be a rare item that gives a +1 to the AC and saving throws of the ship and everyone on it. A Cloak of Displacement is a rare item, so a displacement illusion engine for a ship that makes an illusion of the ship appear in a slightly different place would be a very rare item. Like a character, a ship can only attune to three items. To randomly award such ship items, roll on the next lower table and adjust it to fit. For example, if a hoard calls for rolls on Table G, roll on Table F instead and make it a ship item. If it is a personal weapon, you can reroll, or make a larger ship-combat equivalent, or make it a point-defense weapon with unlimited uses. For example, if you roll a Wand of Web for a ship object, you could make it a device that can launch a large anti-ship or anti-asteroid web up to seven times and recharges when in port, or a magitech gizmo that lets someone sitting at the control panel cast normal webs at will to repel boarders. If you feel like messing with ship weapons, a 'Weapon +1' table roll result could be a lightweight masterwork or magical ballista suitable for mounting on the bow of an adventuring ship. 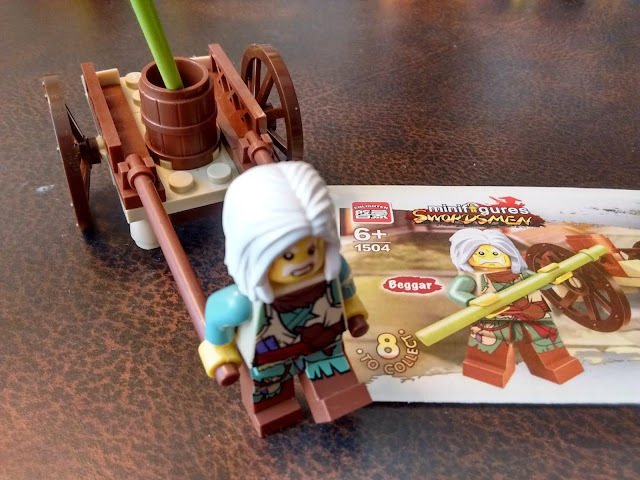 A 'Weapon +2' is a mangonel and a 'Weapon +3' is a cannon. In each case, loading, aiming, and firing can be done by one character with a minor and standard action, but only if the ship is pointed in the general direction of the target. For an interesting combat encounter that leads to satisfying loot, roll up these kinds of ship items before combat for high-level ships that the party is attacking or boarding. Then after they win, they get to claim the items for their ship. If you roll an item that gives a character a fly speed, make it a ship item that allows the ship to operate in gravity. This could be limited-time or difficult to use, like an inflatable gas bag that transforms the ship into a blimp or hot-air balloon. Buying new ships and outfitting them makes an excellent money sink for the party, especially in a setting where it is hard to purchase magic items. If the party wants to buy or commission a ship item, have them roll a Persuasion check to represent negotiations. Success means that they find somebody that has or can make something of your choice. Higher results on the check mean more options are available; give them a menu of a few things to buy. Most things can be handled with a simple abstract skill check. Set the DC based on what kind of campaign you want to run. I am running a fun friendly game where most things just need a DC 10 check to avoid problems, and high results can cover for someone else's low result. DCs will go up as they move into more hazardous and lucrative regions of space. I do not require all checks for all journeys; I mainly use them to add randomness and spice to the game. When appropriate for the story, I just have them arrive where they need to be without making any checks. For a more realistic and gritty game, require higher DCs for everything and/or have problems arise if anyone fails, which will require that the PCs build their characters around sailing or hire expert assistance. Any character that is given or could learn the water vehicle proficiency instead learns the space vehicle proficiency. A successful journey requires four checks: navigation, steering, piloting, and lookout. Navigation: Plotting a course is an Arcana check and/or an Int-navigator's tools check. Success means arriving on time, high rolls mean taking advantage of some temporary condition to get there faster, and low rolls mean losing time or possibly getting lost. They have disadvantage on this check unless someone on board has traveled the route before, or they have a good detailed recent chart describing the path. They have advantage if they have personally traveled the exact route in similar conditions a couple times before. Steering: Ships are steered by hauling on the lines that connect to the wings and sails. This is a Str check for tactical movement, and a Con check for long-term operation, with vehicle proficiency added in each case. Having more people help lowers the DC. If the check fails, impose disadvantage on the Piloting check. Piloting: Reading the weather and terrain and avoiding storms, floating space rocks, creatures, or magical phenomena is a Survival check and/or a Wis-vehicle proficiency check. Low rolls mean running into some hazard, possibly damaging the ship, while high rolls could mean saving time or finding something interesting to explore. Lookout: Being the lookout is a Perception check. Low rolls mean they get ambushed, and high rolls mean they get to ambush things or steer around them, or that they found something interesting to explore. Identifying ship designs and flags and knowing who is likely aboard a certain ship is a History check. Knowledge of naval and other military strategy is also a History check. Unrepaired damaged ships lose range. Repairing the ship is an appropriate tool proficiency. Mundane ships and basic structural components are fixed with things like carpenter's and smith's and tinker's tools; sails are repaired with leatherworker's tools (sailcloth is as tough as leather); and magitech engines are repaired with things like glassblower's and jeweler's tools. Basic repairs use Str, Dex, or Con as the base stat the proficiency is added to. (Con checks are for tasks requiring long repetitive simple work.) Figuring out how to bodge together a complicated or extensive repair is a Wis check. The ship's range might also be upgraded with the same proficiencies, although that requires more raw materials, and coming up with the plans for the upgrade is an Int check with the relevant tool proficiency. Alchemist's supplies can be used to make magitech fuel from raw ingredients, and calligrapher's or painter's supply proficiencies help make better maps and charts, or charts that can be sold to others. Most ships will have at least a few locations where a person has three-quarters cover from most angles. Most enemies want to board the ship rather than trade shots at range, and will often take some ranged fire before they board. Increase the number and difficulty of enemies a bit to account for this, without awarding extra xp. When things attack a moving ship, they have to spend 20 feet of their move keeping up with it. Damage to the ship lowers this number. If they want to move and attack, they can move their speed minus 20, but usually they will double-move to try to board. Most enemies will try to start behind cover or concealment so they can get close without being seen and board the ship quickly. If the characters want to move the ship on the battle grid, the person at the helm makes a Wis or Int check, adding vehicle proficiency, and one or more other people makes a Str check, adding vehicle proficiency. Take the highest of the Str checks, and then the lowest of that number and the helm check. Divide by 5. That is the number of squares they move the ship on the grid, in any direction. The crew can make a 45-degree turn instead of moving five feet. 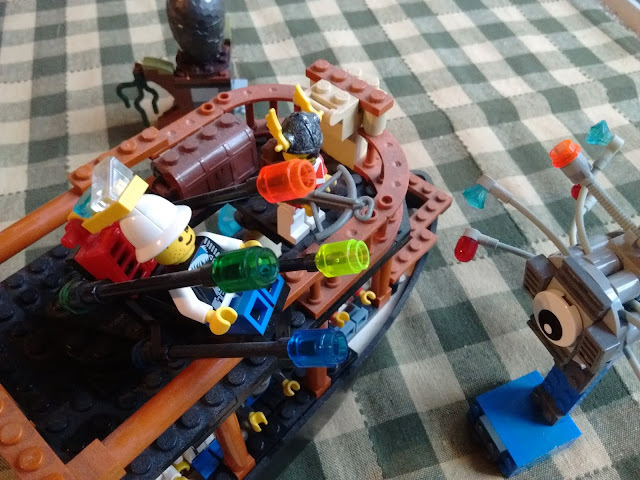 The ship can be damaged by a powerful attack. Enemies might damage it to make boarding easier. For my game, I have the first attack 'shake' the ship to warn the players that another one might damage it. Use the rest variant where a short rest is a night's sleep and a long rest is several days of recovery. Require the party to be in a port for a long rest. While in port, the party needs to spend 10 gp for the lodging, meals, and amenities needed to benefit from a long rest. (Characters with background or training relating to wilderness survival might be able to make a campsite or base that counts as a port, if they are on an island with hospitable terrain.) This rule makes each 'adventuring day' a different voyage of the ship, and makes it very important to maintain access to friendly ports. When using this variant, you should change all magic items that recharge daily so they recharge after a long rest. This keeps things balanced, and also lets you change their flavor to a magitech device or weapon that must be recharged, refueled, or reloaded at a port with appropriate facilities. Body Part Loot: Many enemies do not drop gold or items; they drop magical materials that can later be crafted into magic items. I have found that spending hit dice for downtime activities is an excellent system for handling the many things that players want to do between adventures. I have developed a simple set of mass combat rules that turns epic battles into a set of interesting level-appropriate encounters for the party. The level of encounters on an island, either natural monsters or sapient troops, is based on the ecological richness of the island, which can be estimated by looking at the island from a distance. A DC 10 Nature check gives the approximate level, and a DC 15 check gives the exact level. This information may also be on charts that can be purchased or found. Small objects like people and ships follow Newtonian physics: any action causes an equal and opposite reaction, and objects in motion stay in motion. However, larger objects like islands do not necessarily follow these laws. They might be anchored to a particular spot so they stay in one place no matter what forces are applied to them, or they might move through space in predictable patterns or seemingly at random. Clerics say this is due to the will of the gods, Wizards say they are attached to objects in a nearby plane of existence, druids say the land has a mind of its own, and bards say that the universe arranges itself as Narrative demands. Gravity planes and gravity bubbles are created wherever there is a sufficiently flat boundary between Earth and Air. Their size depends on the size and shape of the boundary, not the mass of anything. 'Earth' is roughly defined as being solid and close to Platinum on the periodic table. Liquids, gases, and organic matter will not generate gravity, nor will loose clouds of dust or rubble. The gravity plane is aligned to the flat surface, and the gravity bubble extends into the Air direction of the boundary. At the gravity plane, there is a small region where gravity pulls things to the plane from both directions. This means that an object will fall toward the gravity plane, bob for a bit, and then rest when half of its mass is above the plane. When two gravity planes overlap, the larger one dominates and the smaller one ceases to exist. 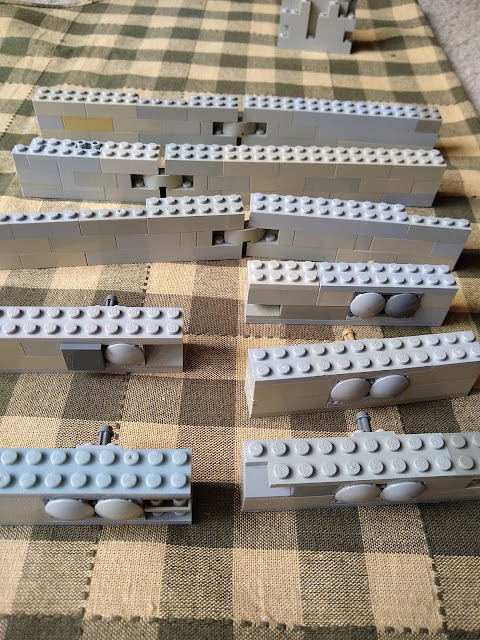 When similar-sized gravity planes are close to each other and mostly aligned, they merge and twist together, which often causes the objects generating the planes to move and rotate so the flat surfaces are aligned. Whenever there is a tunnel in a portion of rock that is in zero gravity, i.e. not in a larger gravity bubble, a gravity plane will form at the flattest part of the tunnel. 'Down' will always be in the direction of the flattest tunnel wall, no matter how the tunnel twists and turns, which can be very disorienting for people not used to it and can make mapping very difficult. Usually the gravity planes twist and merge so it feels like adventurers are walking along a normal corridor, but clever tunnel builders can sculpt the gravity planes to make traps where people will suddenly fall sideways or up after stepping into a differently-aligned gravity bubble. Rocks too small or irregularly shaped to generate gravity planes are called asteroids, and places with a gravity plane are called islands. Most islands will have a mostly flat top and an irregular bottom in zero gravity. It is possible to turn an asteroid into an island by shaping it to make a flat surface, using mining equipment, explosives, and/or earth-moving magic. It is also possible to use these techniques to destroy an island's gravity plane, or change its orientation. Any sensible island-based civilization will patrol the bottom if its islands for anything that looks like an attempt to make a new gravity plane and make everything on the former gravity plane drift off into space. At your discretion, it might be possible for a single island to support multiple gravity planes pointing in different directions. Also at your discretion, there can be spherical moons with a spherical gravity plane that points to the center of the moon. Larger islands with multiple gravity planes might automatically collapse into such moons as their gravity planes merge and bend together. Like islands and asteroids, it is possible to turn islands into moons and vice versa by changing their shape. On these moons, the gravity bubble usually extends about a hundred feet beyond the surface, although that changes based on how flat the surface is. Such moons are usually hard to land on, unless there are trees or mountains tall enough to extend outside of the gravity bubble, and even then, docking is hazardous because drifting into the gravity bubble will cause the ship to fall and crash. These moons will have an 'underdark' below the gravity plane where gravity points to the flattest tunnel wall. Ships generate gravity because of specially designed, shaped, and textured metallic sheathing on the bottom of their hull. This metallic sheathing generates an appropriate gravity bubble for the ship, in addition to preventing things from growing on the hull. Most ships are sheathed in copper, but higher-end combat ships will have more expensive sheathing to save weight. Silver gravity planes weigh half as much as copper ones, while costing five times as much, and the pattern continues for gold and platinum. It is possible to extract 'free' energy from a gravity bubble with a big flywheel that is partly in the bubble and partly in zero gravity. The flywheel will spin forever as long as it is properly positioned and maintained, and its energy can be harnessed with belts and chains to drive various kinds of mills, or to power dynamos in a magitech setting. Most island civilizations will have at least one of these. However, the energy is not actually free; it comes from the mass of the material used to make the gravity bubble. This mass is converted into energy in an inefficient way that causes lots of magical discharges and, if done one a ship, requires the gravity sheathing to be repaired or replaced much more often. On a ship, it is almost always more efficient to use a proper elemental-matter reaction engine. 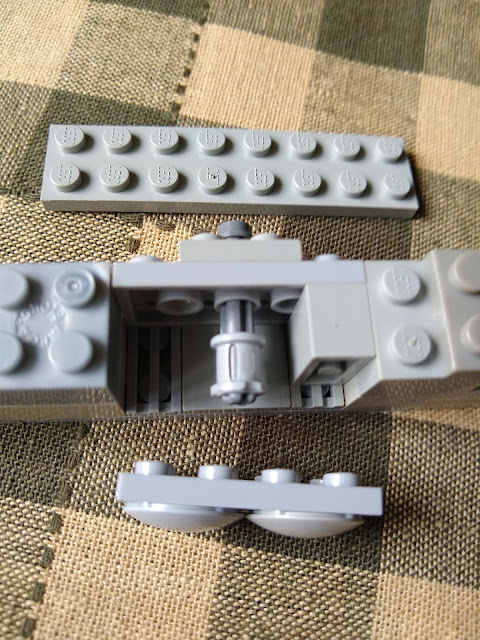 Gnome sidewheelers are ships that use this flywheel effect for a power source, and they are known for being plagued with random explosions and magical effects. On an island, the gravity bubble is formed by rocks, and the flywheel can be kept in an isolated part of the island where random magical phenomena can be tolerated. 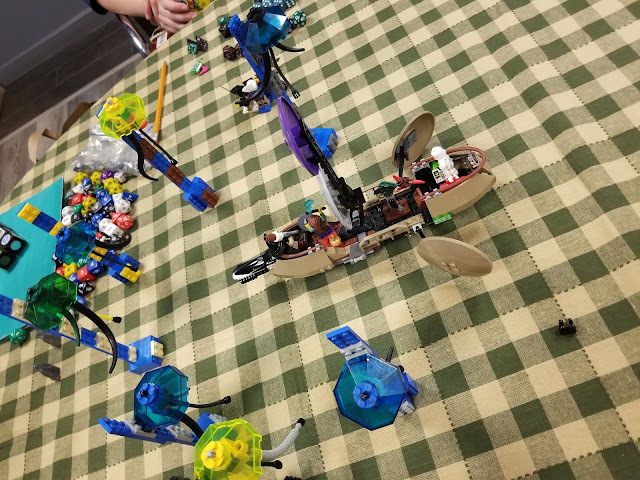 Many young people get their first taste of magic and adventure by venturing into the flywheel zone to fight the mutant beasts, awakened plants, small elementals, and weak outsiders created or summoned by the magical discharges generated by the flywheel converting rock mass into kinetic energy. In this world, most chemistry works about the same as in ours, but nuclear physics is very different. Instead of electrons orbiting a nucleus, atoms are a combination of particles of the six alchemical elements of Earth, Air, Fire, Water, Light, and Dark. These particles can easily be liberated from atoms, and when liberated, opposite particles attract and are annihilated, generating large amounts of energy. Alchemy is the extraction and manipulation of elemental particles. These alchemical processes can happen in biological systems, and commonly occur in the bodies of fantastic or magical creatures. A common side effect of this process is to create a field that dramatically reduces the weight of the creature. For example, a (live) beholder with a mass of several hundred or thousand pounds weighs almost nothing, and floats around like a balloon, because of this effect. Elemental-particle physics means that civilizations at a low tech level have access to extremely efficient, and relatively safe, energy sources. Civilizations that understand basic chemistry can reliably extract and refine elemental matter, which can be used to fuel elemental-matter reaction engines that might look like crude steam engines but have the fuel energy density and mass-energy conversion efficiency of a cold-fusion reactor. Even stone-age civilizations have some access to this energy, either by taming and controlling fantastic creatures or by killing them and harvesting their body parts. Elemental transmutation is easy and common. One of the most basic alchemical processes is the transmutation of the specie metals (copper, silver, gold, and platinum) into an amount of a different metal with the same gp value. The 10:1 exchange ratio between adjacent metals is a basic fact of physics. For example, during a short rest, anyone with alchemist's supplies can turn 100 pounds of copper (5000 copper pieces) into 10 pounds of silver and 90 pounds of sand by passing a DC 10 check. Refining it into one pound of gold is a DC 15 check, and going straight to 0.1 pounds of platinum is a DC 20 check. Similarly, if they need 100 pounds of copper for something like repairing the ship's gravity sheathing, they can make it with 50 gold pieces and 99 pounds of sand or rocks. Magic often works according to laws of similarity and contagion. This is the voodoo-doll effect: if someone have something that was once a part of an enemy, they can use it to harm them or cast a spell on them. If two things are identical, or were once part of an identical thing, or were produced in identical ways, they are fundamentally connected. This makes civilization based on factories and mass production almost impossible. Everything that anyone might want to sabotage for any reason must be hand-made by an artisan. It also makes it harder to advance civilization on the first place; the inability to disseminate printed matter makes knowledge sharing and education much harder. This means that civilizations can stagnate for millennia with a Medieval or Renaissance economy, even though they have access to reliable cheap energy. Without the labor-saving efficiency of mass production, they are stuck in a world where everything must be laboriously hand-crafted. At your discretion, there may have been ancient technological civilizations that resembled ours, based on printing presses and factories, that fell after people discovered how to use magic to destroy them. If so, the ancient ruins of their cities and factories may contain their books and devices for adventurers to find and scavenge. In my game world, the elves have found a way around this by developing biotech. After millenia of work in selective breeding and genetic engineering, they have developed plants that can produce almost anything. They can plant the right seed in the right place, and then a hundred years later, they come back and harvest a mithril chain shirt. The biological origin makes things different enough to escape magical similarity-based sabotage, while still being produced with a minimum of labor. Over the past few years, there has been a lot of innovation among the Chinese brick manufacturers. Several of them have moved past making copies and started to make their own designs based on Chinese history and mythology. These are obviously (English translations of things) intended to appeal to the domestic market; Chinese parents and children want to buy something from their own culture. 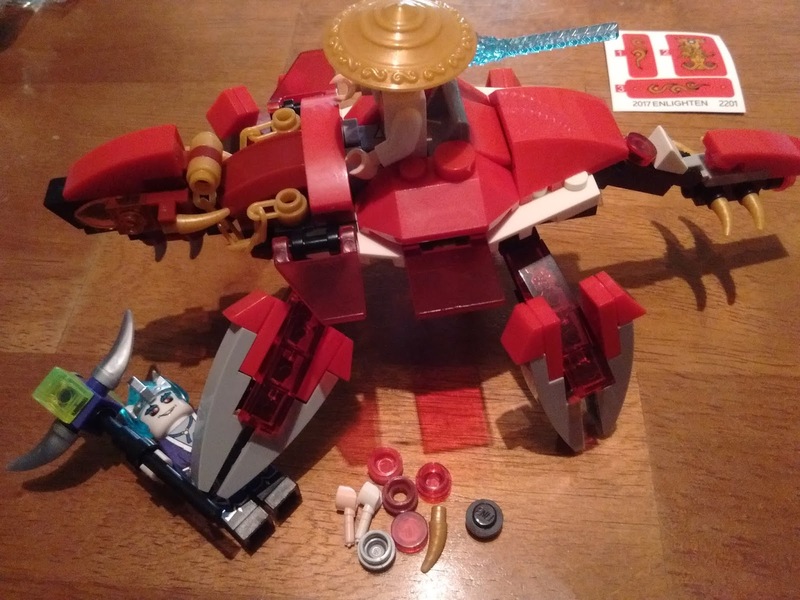 Lego has never done anything from Chinese history, so that these sets and minifigs make a great addition to my collection. A couple months ago, I went on Aliexpress and ordered some of them. 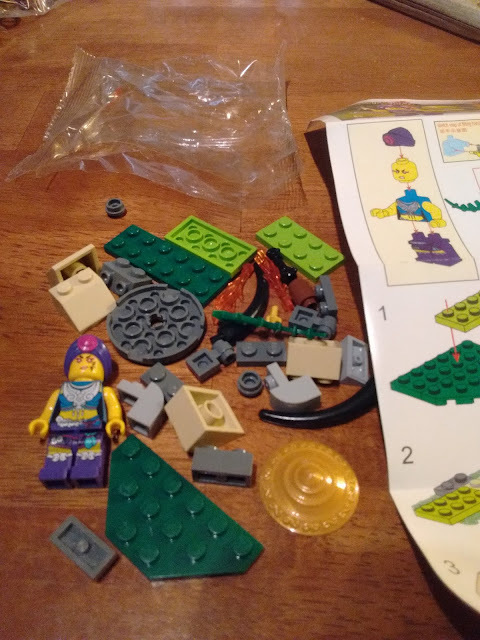 The best value of my order was Enlighten Series 4 minifigs: a set of eight stock characters from Chinese historical stories, each with a small build. I highly recommend these, and will be getting more of the series, even the ones that have a couple of non-fantasy figures mixed in. This makes sense. The richer parts of China today have average family incomes similar to what Americans and Europeans had in the 80's, so the kinds of toys the children or their parents can afford to buy would be similar. Toy stores sell these Enlighten figures separately in boxes; one of them would be a good random treat for a child. 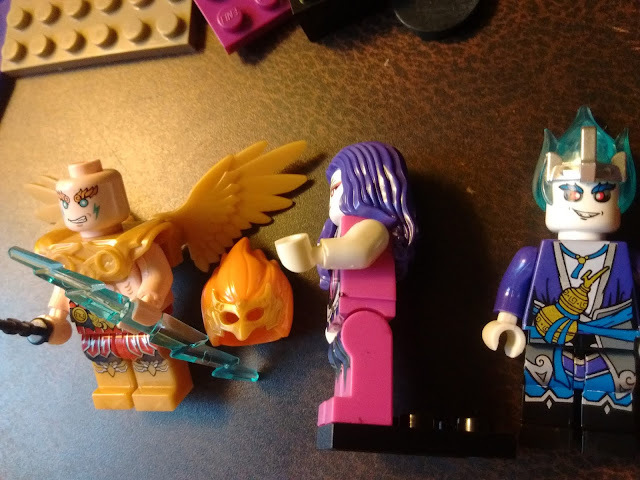 The Ghost Tribes character set was similar, although the quality was not as good. The clutch and tolerances were a bit worse, and one of them was missing an important part. They were also more of a generic fantasy collection instead of being Chinese-looking. I might still recommend them to people who are just starting out and want to build up a basic supply of minifigs, unless Lego starts making historical sets again. 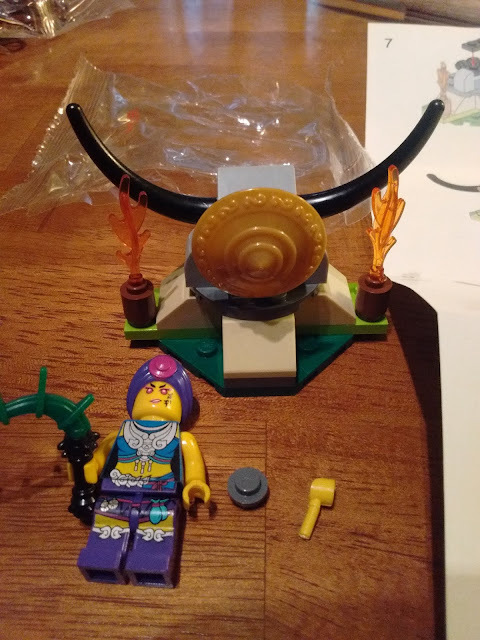 I was also very happy with the 'Creation of the Gods' Enlighten sets I ordered. 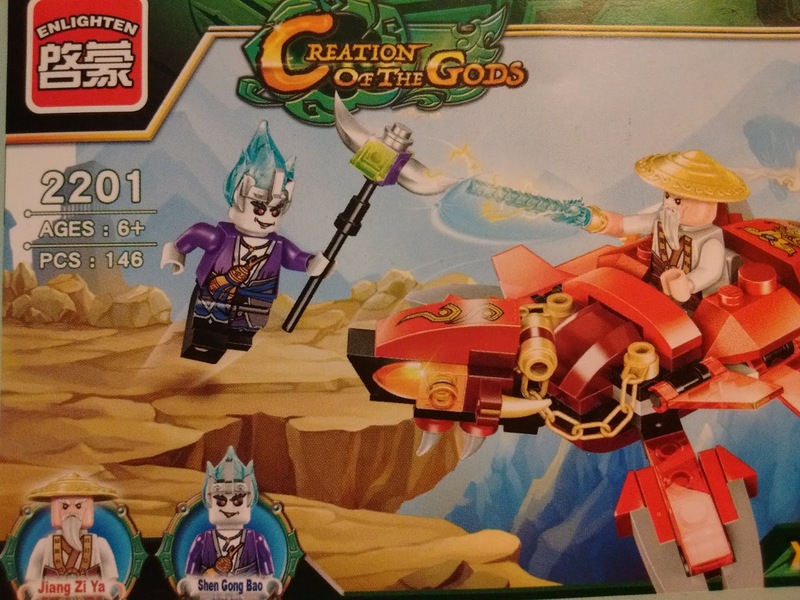 Enlighten's quality keeps getting better each year, and the 'Creation of the Gods' sets are the most recently released in their fantasy line. I recommend browsing the Enlighten storefront fantasy section, which has both their European and Chinese fantasy sets, and trying out something that interests you. 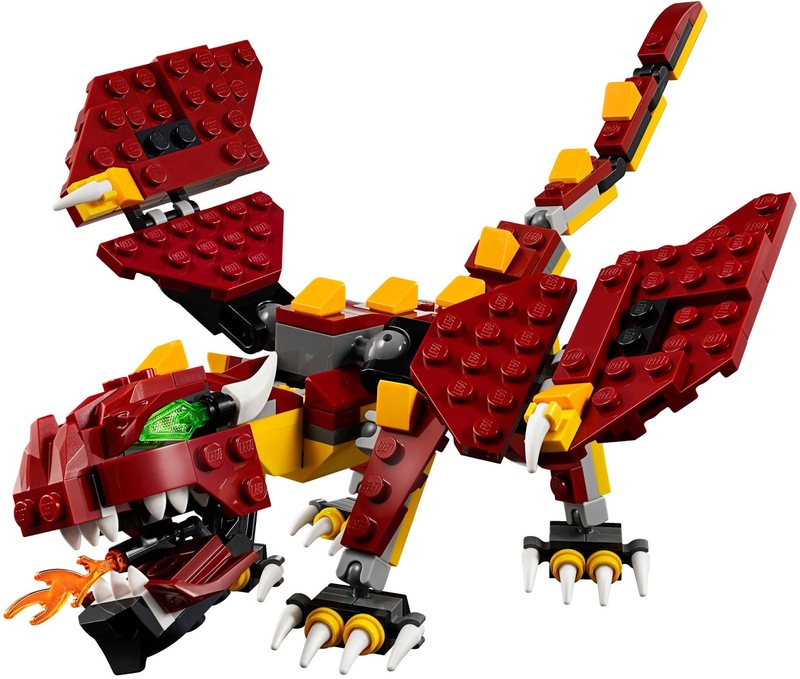 There are several $5 sets that give you two or three good figures along with an interesting terrain or monster build. Unfortunately, as with Ninjago and Nexo, there are a lot of techy vehicles as well. I guess the same things that appeal to little children the world over. For some reason, a lot of the Enlighten stuff is not on their storefront. 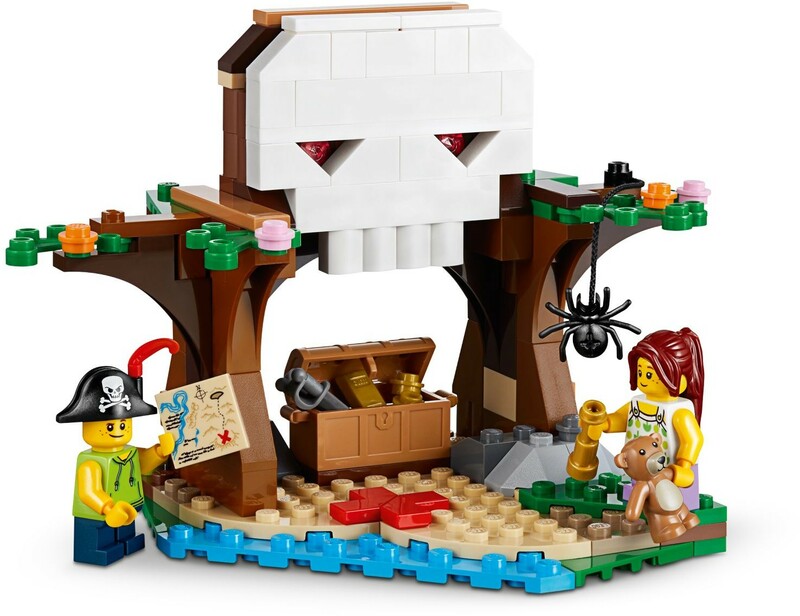 It does not have their minifig collections, or anything from the 'Legendary Pirates' line like the Crocodile I reviewed earlier. This store has a mix of their older pirate stuff that is basically a copy of Lego designs, and the newer ones that are original designs. I also tried ordering a 4-pack of minifigs riding brick-built beasts, obviously inspired by World of Warcraft. The designs were very good, and there were a lot of nice unique printed parts, but the low quality means that I can't recommend them. The ball-and-socket joints were a big problem: either so tight that they bent the plastic or so loose that the creature would not stand up. The minis also had a leg attachment system that was very weak. Kazi brand has some work to do before they can catch up with Enlighten. Another series of note is the Winner brand 'Fantasy Westward journey' line. It was tempting, but I did not get it because it was too specific to Chinese mythology and would not fit as easily in my game, and I was unsure of the brand's quality. 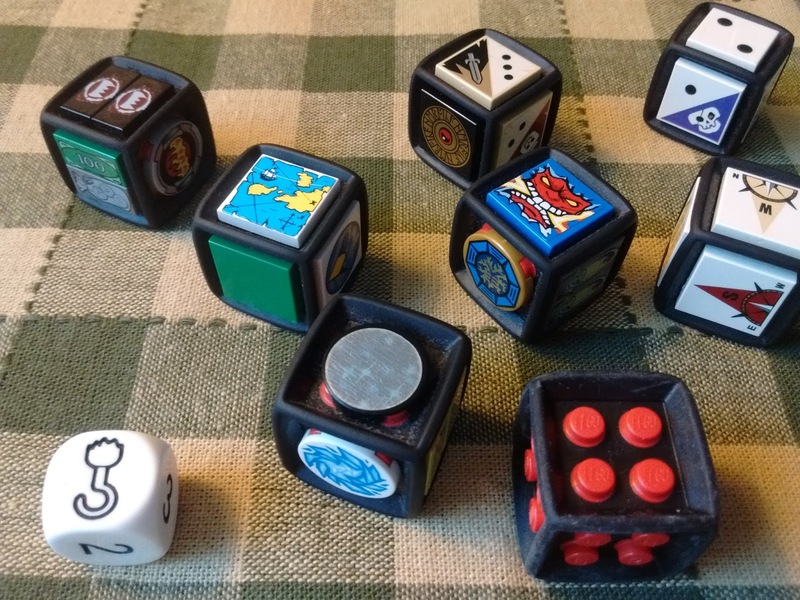 The dice have six faces that can take a 2x2 Lego plate, or a combination of smaller plates. The rubber on the edges makes them bouncy and protects the plates. There is a blank one, with no tiles attached, on the bottom right of the picture above. They came with the discontinued Lego Games sets, and you can customize them by adding whatever tiles you want. Most large collections will have a lot of these blank, stickered, or printed tiles. I highly recommend buying some and using them, especially if you have interesting printed tiles sitting around. The dice are incredibly cheap on BrickLink. I got 20 of them for less than $5 including shipping, and prices have not changed since, although not many sellers have enough of them to justify the shipping. 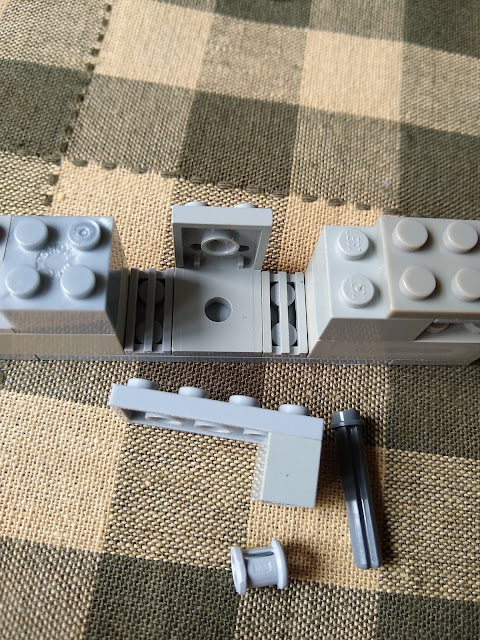 You may want to combine the order with other parts. The Heroica dice (below), used for the results of searching, crafting, and negotiation. Roll it with the d20 skill check. The number represents the number of things you obtained with a successful roll. The other icons may, depending on the situation, represent complications or obstacles that you have to overcome. So if you roll to search a dungeon for clues, the two pips and a skull side represents finding a couple things but also triggering a trap. The gold shield side represents extraordinary success. A directional dice, with tiles for the four directions, and two faces with arrows. A face with two arrows pointing the same direction calls for a reroll and double distance, A face with two arrows pointing different directions can call for two adding two rolls, or it can represent "you got lost and/or spun around". A dice for the six common D&D attack energies of fire, cold, lightning, radiant, acid, and thunder. A dice with the terrain types/locations of forest, mountain, ocean, desert, wildspace, and underdark. Two different dice with six icons that represent concepts like wealth, rage, stealth, magic, healing, etc. Used for determining the properties of situations, people, or items. These dice, singly or in combination, are a great way to determine what happens when players create or investigate something unexpected. I'll have the player roll a couple dice, and usually the results give inspiration to help me come up with the thing that happens next. The die in the bottom left is a Lego piece that came with a few Adventurers sets from 2003. I use it as the 'Plot Hook Die' in my games. Whenever a player rolls a downtime skill check they are proficient in, they can replace their proficiency bonus with a roll of the plot hook die. The numbers add to the result, but if the hook comes up, it means that their roll, good or bad, causes a significant change in the plot, or at least causes something interesting or unusual to happen. A Plot Hook accompanying a low roll means that the skill check revealed or created an emergency that will have to be dealt with immediately, while high numbers represent uncovering fantastic opportunities that will give great payouts if the party pursues them. A medium roll means uncovering an interesting side-quest opportunity that will probably be more lucrative than a standard mission. In all cases, I encourage the players to tell the story about what happened. For example, someone rolled the Plot Hook Die on a routine diplomatic mission to open trade relations with a city of minotaurs in the Underdark. The result was a 1 and the plot hook. The player decided that this meant that the minotaurs had been taken over by a hostile invading force of drow. Dealing with this drow invasion and its side effects ended up taking up the next year of the campaign. The decision of whether or not to roll the Plot Hook Die added a great dimension to the game. If players felt that the game was already complicated enough, they avoided it. If they wanted to shake things up, they chose to roll it. 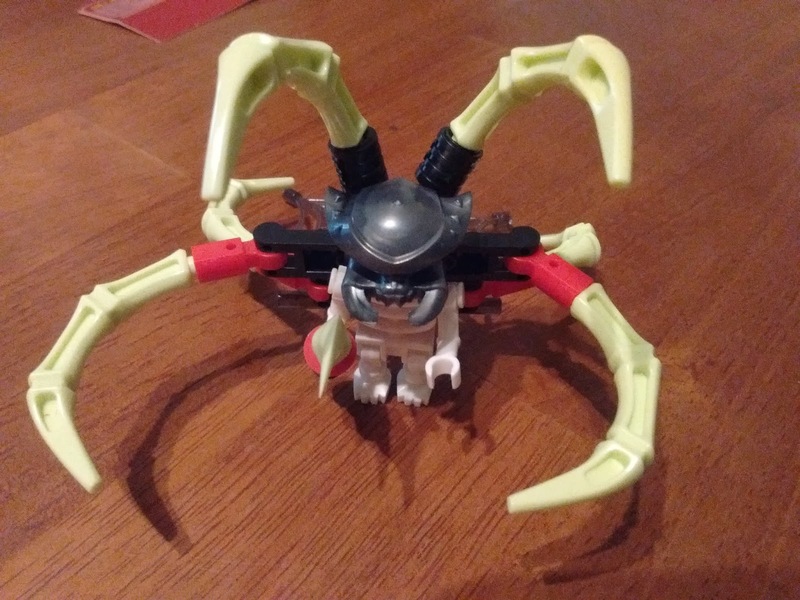 It, like the other Lego dice, has been a great addition to my dice bag, and I would not want to run a game without it. As always, sets are sorted in roughly descending order of how much I recommend them, and selected for variety and versatility. 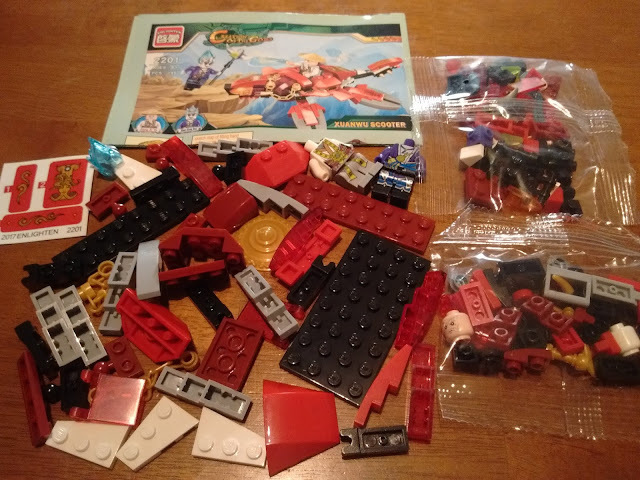 I am tailoring the recommendations to people with a relatively small collection, for example people who started by just using Lego minifigs for the PCs and are thinking about adding Lego monsters and terrain for a reasonable price. If you have an extensive collection, then you probably know what you want to get already. Edit: Added a couple sets that were released in August. The dragon is the star of this $15 3-in-1 set, which can be rebuilt into a fire giant and a colossal spider. It is obviously an update of the Red Creatures set I recommended in 2015, which was selling for twice as much on the secondary market. The newer set is even better, taking advantage of new parts. Highly recommended. 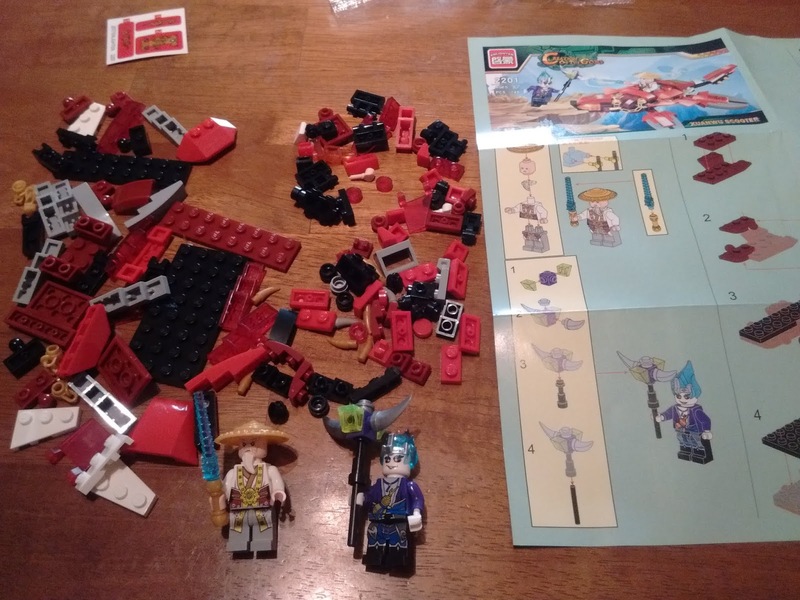 If you only get one Lego set to play fantasy RPGs with (after acquiring the PC figs), get this one. 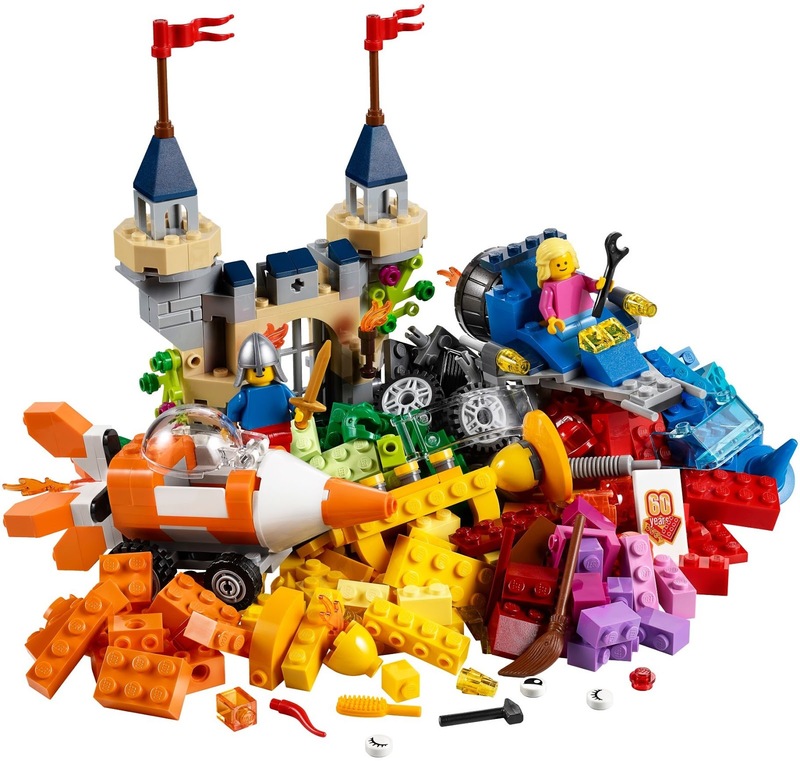 Like many sets, Amazon has it for 20% off, or $12. The 'basic pile of bricks' sets have gotten much better for Lego's 60th anniversary. 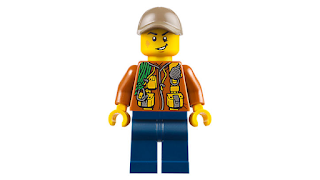 They finally added minifigs, tools, and lots of good accessories. 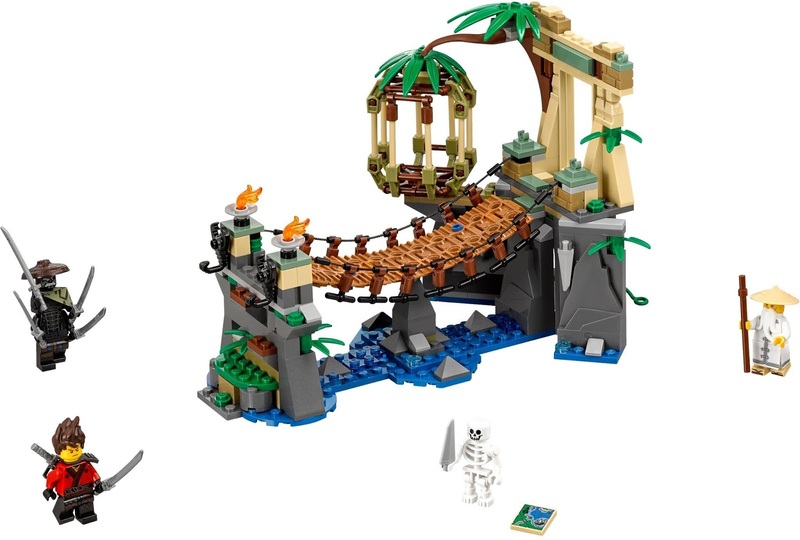 These two sets are perfect for a fantasy game. They are my new recommendation on the Starter Guide, but they are also a good deal for expanding existing collections. 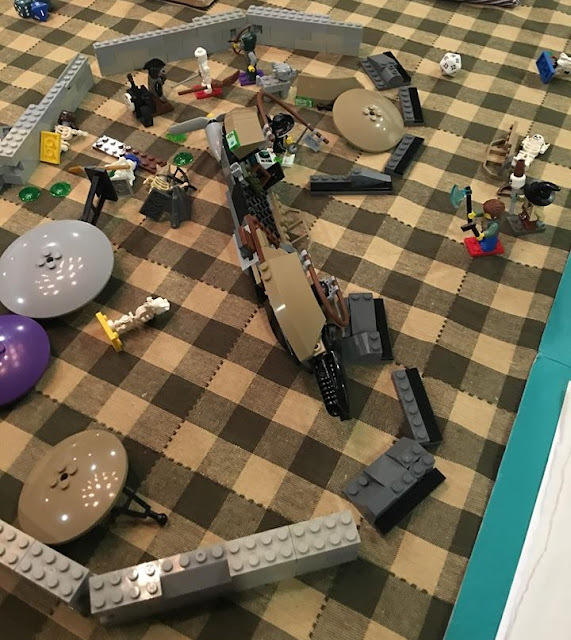 Throne Room Showdown. I always like the little sets that have small modular terrain pieces. They are cheap, good for establishing a scene, and can easily be stored and transported. With five minis and a lot of nice accessories, this is a great value for $20. Master Falls is an excellent rendition of a classic adventure location: a rope bridge over a water-filled ravine leading to a castle or dungeon entrance. 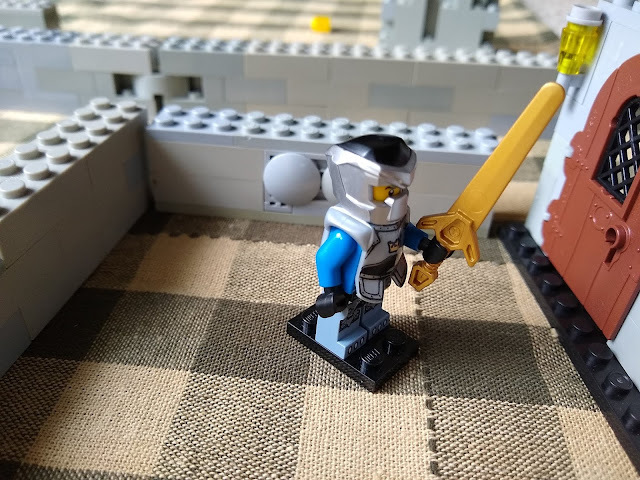 Unlike most Ninjago locations, this one would not look out of place in a 'traditional' European or generic fantasy setting. 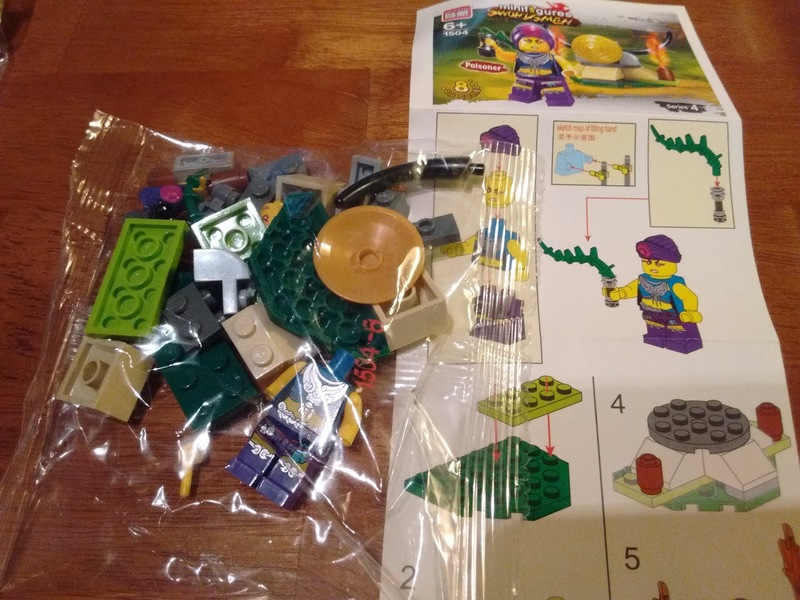 With its three minifigs plus skeleton, including the always-useful old sage and four-armed monster, it is a good value for $30. Aira & the Song of the Wind Dragon has a nice sky palace and an elemental dragon. Many of this year's Elves sets feature elemental animals that are probably too cute for most games, but this one is a good fit for almost any play group. 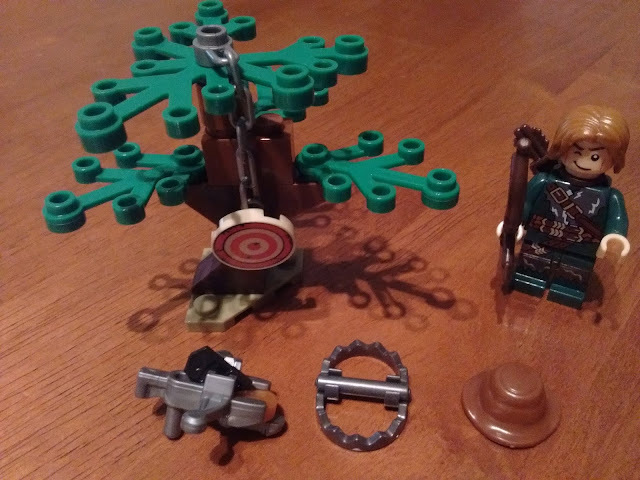 Aragog's Lair has a lot of nice things for a game, including terrain, giant spider, and useful minifigs and accessories. 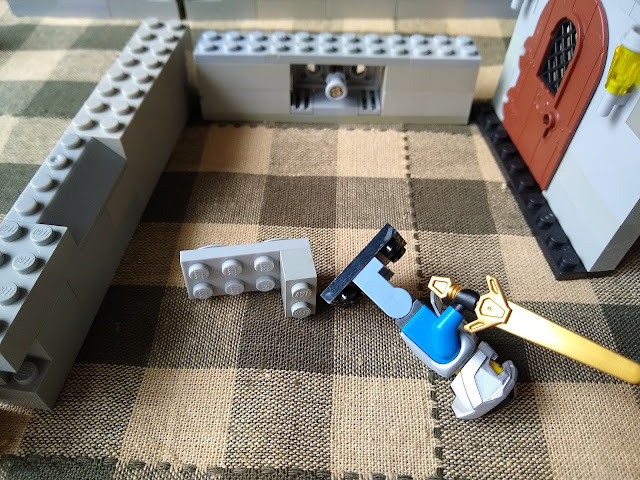 Temple of Resurrection: When you make entire locations out of Lego, instead of just putting dungeon dressing on a grid, it starts to get more expensive. But it can be worth it for the grand showdowns or boss battles. 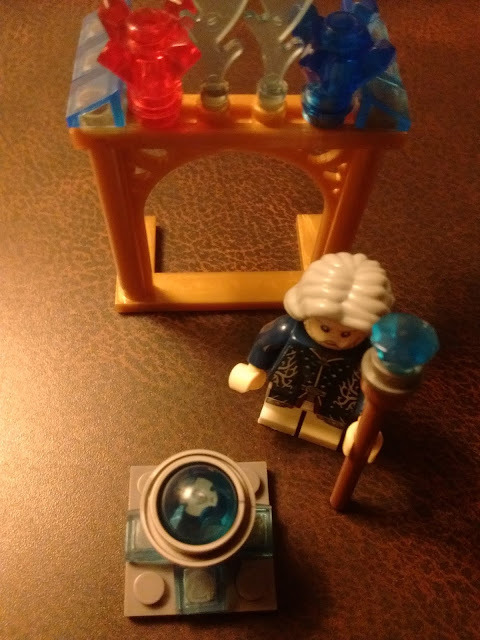 This set is a throne room and dungeon combo that has a lot of potential. If you are getting one of the larger sets, get his one. Sanctum Sanctorum Showdown is another option for the larger adventure site. The brownstone house fits quite well in a medieval fantasy world with minor adjustments, and you get a lot of interesting accessories as well as a bigfig that will serve well as a troll or ogre. People have differing opinions on using 'modern' looking minis. I think the torso piece with ropes, carabiner, and tool pouches is perfect for a dungeon-delving adventuring rogue in a world with magic items and masterwork exotic tools. I also think that a scientist with lab coat full of test tubes makes a good NPC. 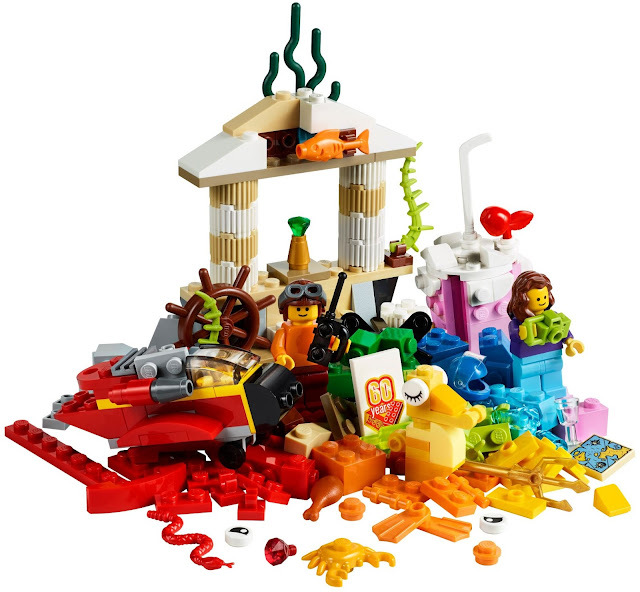 If you and your playgroup agree, then this set is a great value. If not, then you are paying $10 for an alligator, a small terrain piece, and a boat that needs a bit of work to look old-fashioned. 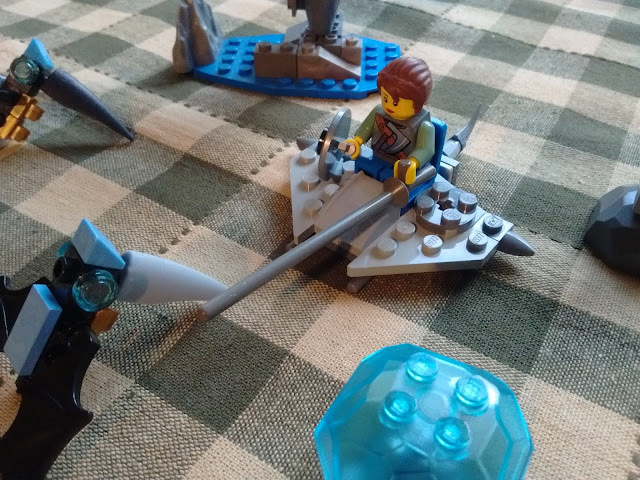 Lance's Hover Jouster is the least-techy of this year's Nexo Knights sets. It has interesting accessories and minifigs, and can be turned into reasonable fantasy terrain or dungeon dressing with a little work and creativity. Modular Winter Vacation. While not as useful as some previous Creator 3-in-1 sites, it lets you make a rustic hut in the snow that can be a good adventure location. The second build, with the snow monster and the outhouse, is better than the main build. Most of what I recommended last year has already been retired, in some cases doubling in price on the secondary market. The Goblin King's Fortress makes a very good plant-infested mystic fae dungeon/castle adventure location. 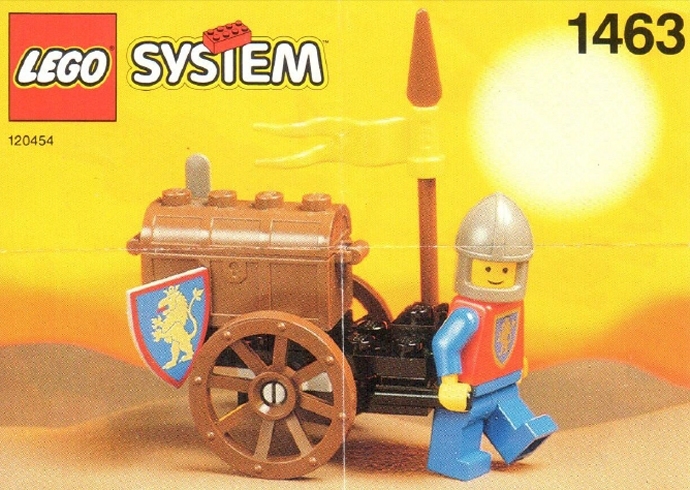 When I first started using Lego to run RPG's, I carefully sorted out my minifigs based on their suitability for a medieval-era campaign. I pulled aside any heads or torsos with modern features like zippers or sunglasses and kept them out of the PC tackle box. This left me with mostly Castle and Pirate minis, along with a few from Town and Adventurers. Later, I started to think more deeply about what a world with demigod-power adventurers, reliable magic-users, and ruins from advanced ancient civilizations would actually look like. I eventually realized that non-medieval anachronisms were not only possible, but inevitable. There is no way that a world that operates on the rules presented in fantasy RPG rulebooks would look like medieval Europe, or any other specific historical setting. 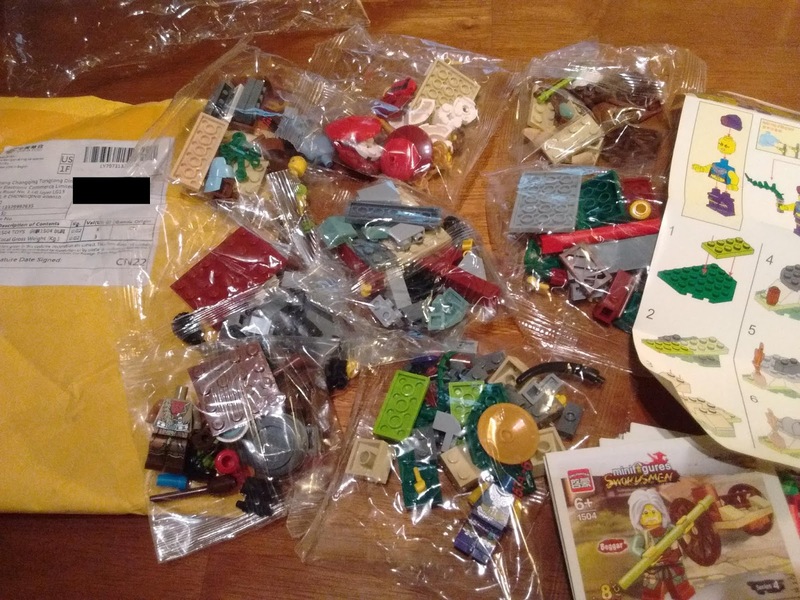 Now I will use almost any minifig that shows up in the bulk brick lots I order from shopgoodwill.com. It helps that my games have a lot of content inspired by Spelljammer, Planescape and Eberron, but that is probably not necessary. A recent game had a lot of orcs clad in a motley assortment of various armor scraps, and nobody even noticed or cared that one of them was stormtrooper armor. The rest of this post will not be about Lego, but will instead be an extended discussion about why no fantasy RPG world will ever look and feel like any historical period. Even if the technology level is the same, the shape of society will be radically different. A fundamental lesson of history is that the structure of society depends on its military technology. The Middle Ages were the way they were because the most powerful force on the battlefield was the mounted knight in armor. Knights were the foundation of military power, which meant that they inevitably accumulated economic and social power as society grew to serve them and their needs. The medieval manor was a self-contained economic engine devoted almost entirely to the creation and maintenance of armored knights. Everything served them. The economy was devoted to giving them horses and armor and fortifications. The culture of the nobles focused on identifying and developing the traits that made men good knights. Contrast this with ancient Rome or warring-states China. In those places, the most powerful force on the battlefield was a disciplined, professional infantry formation. As a result, their economy and society were organized around maintaining these infantry armies. Things were more centralized and standardized, with large economically integrated empires connected by good roads, and their culture valued discipline, scholarship, and bureaucratic competence much more than 'chivalric virtues' like bravery. Also contrast the middle ages with what happened after firearms were invented. Before firearms, a mounted knight could defeat an arbitrary number of peasants on the battlefield. After firearms, the number of bodies on the battlefield became much more important. This shifted power away from the aristocracy and toward the people. A revolution by armed commoners became a much more serious threat, and governments responded by giving them more rights and/or inventing new technologies of social control like propaganda and nationalism. This section explains why powerful adventurers make traditional military forces obsolete; skip it if this fact is self-evident to you. In the world of the fantasy RPG, the most powerful military force is a party of high-level heroes. In most game systems, a group of high-level adventurers with basic tactical skills can easily crush a nonmagical pre-modern army of almost any size. Even if they can't wipe out the opposing force in a single day, they can easily use their superior mobility to retreat, rest, and come back later to finish the job. The superiority of the adventuring party is even greater when you consider the issues of deployment and force projection. A premodern army will only move 10 to 20 miles a day, and unless they are backed by an empire's worth of supplies and logistical competence, they will strip the land bare like a horde of locusts as they move. By contrast, an adventuring party can use flight, an airship, or magical mounts (or just a teleportation spell) to deploy to where they are needed very quickly and cheaply. This would make them an incredibly valuable military asset even if they were weaker than a large army in open combat. Furthermore, the logistics of an adventuring party make them even more attractive and useful as a military asset. Unlike every other military force ever, a high-level party requires no supplies at all to function, not even food. (By high levels, any sensible party will have magical means of creating food and ammunition, and repairing their gear.) While they are more effective with a supply of healing potions and other consumable items, this is not at all essential for them to completely dominate other types of military forces. If they are loyal to you, or your cause and values, their incredible power comes with no support cost or logistical demands. Additionally, the nature of the world makes access to a high-level party essential for basic survival. Even if you are a peaceful country with no intention of going to war or conquering anyone, and/or you have a mundane military sufficient to avoid being attacked or conquered by any of your neighbors, you absolutely must have the ability to contact an adventuring party and hire or persuade them to save you from demons, dragons, vampires and other existential threats that no army can stop. As described above, high-level parties of heroes make conventional military forces almost useless. There is very little reason to drill armies or train knights, or to construct many of the things associated with them. Large standing military forces of any kind will simply not be a feature of society. There will be police, but no army. There may or may not be any contemporary castle construction. Militarily, there is no point in building castles. Castle walls will not even slow down a mid-level adventuring party, or any other real threat like dragons or demons. However, if the world is infested with dumb wandering monsters, like beasts and zombies, then most towns will be fortified with walls and/or stockades to keep them out. In a fantasy RPG world, the people with the most power will inevitably be the ones that control or influence the most high-level adventurers. All of the economic, social, political, and religious institutions of society will be devoted to the task of identifying, training, supporting, rewarding, and ensuring the loyalty of people who are or could be part of well-functioning high-level adventuring parties. There will be as much gender equality as the nature of economic production allows. Female adventurers are just as powerful as male ones, and no society can afford to waste their potential power or do anything to make them upset with the current order. Even if NPCs have human sexual dimorphism, which means that the upper-body strength of male agricultural workers makes them more productive in plow-based agriculture systems, which will inevitably generate some economic inequality, there will be far more social equality than in medieval societies. There will not be any witch burning. Anyone with magical potential and any ability to function in a team is far too valuable of an asset to damage, and every authority in the land will make this very clear. Society will heavily encourage people to try their luck at adventuring, and will subsidize any activities that are likely to generate adventurers. If a collection of random village teenagers wants to go exploring the world, the authorities will supply them with training and equipment and aim them at a low-level questing ground. If they die, then the state only lost a few peasants, but if they come back with class levels, the state gained an incredibly valuable military asset. Groups of low- or mid-level adventurers will be carefully nurtured and supported, especially if they are relatively cohesive. At minimum, there will be a heavily subsidized 'adventurer's guild' that gives them basic supplies and support and information about level-appropriate quests. Anyone who can tolerate the regimentation will be recruited into the military, given an income, rank, and status, and deployed to level-appropriate missions. The most valuable economic asset is not land or gold or trade goods. It is high-level items. They are incredibly valuable military tools by themselves, and they are also one of the best ways of attracting, paying, and ensuring the loyalty of high-level adventurers. States will care relatively little about controlling land or gold mines or trade routes, but they will care a lot about controlling sources of powerful items, or information about their whereabouts. If it is possible to create magical items, the entire economy (after the labor and resources required for subsistence) will be devoted to doing so. Conquering and holding territory is very difficult. Adventuring parties can easily destroy armies of conquest, but it is very difficult for them to hold territory and collect taxes. People are unlikely to fear conquest and invasion (although they might fear evil adventurers demanding exorbitant amounts of protection money, or simply looting things). Collecting taxes is much less necessary, and much harder to justify. As long as the local leaders have a connection to a reliable adventuring party, there is basically no need to support or train an army. It is likely to be a world of smaller manors and city-states rather than empires or cohesive nations. The machinery of state is likely to be weak, there will be very little bureaucracy or regimentation. Travel will be very difficult for ordinary people. Because adventurers do not need roads, they will not be built. This will make the world very fragmented, and people very provincial. Because of the travel difficulties, merchants will be rare, and most social units will be in a subsistence autarky. Knowledge and scholarship will be rare, aside from things that make adventurers more powerful. Nobody has much incentive or ability to research engineering or agriculture, but they do have an incentive to research magic spells, combat techniques, and locations of ancient items of power. Congrats for being smart and disabling scripts. I apologize for not knowing how to efficiently give you a useful table of contents without them.